There has been a lot of chatter over the Internet for last few months about OS X Mountain Lion, Apple’s latest OS for the Mac. Considering Apple is an ever evolving company, with consumers developing a growing admiration for their OS X and iOS operating systems, the company have opted for a new direction with Mountain Lion with an offering that shows the first signs of unity between desktop and mobile. After various developer releases that have been pushed out to fix multiple issues, Apple has finally deemed Mountain Lion stable enough to blessed it with a “near final” Developer Preview 4 tag, available for download by developers enrolled in the OS X development program. The release of the Developer Preview 4 version of the new operating system means that Apple is pretty much done applying the polish and finishing touches to the software, with a prime time public release coming next month in July. The Mountain Lion OS has seemingly split public opinion since its announcement, but it definitely goes some way to showing the world just what Apple’s future plans are. The company describes the OS as bringing a whole host of new features that have been inspired by the hugely successful iPad and re-imagined for the Mac, with the hope that it makes the Mac experience smarter, easier and a lot more intuitive and fun. Deeper integration with iCloud allows users to sign-in with a registered Apple ID to automatically have iCloud support across the whole system, something that will greatly benefit features such as mail, calendars and documents. OS X Mountain Lion also brings a significant and much needed update to the iChat application, rebranding it to ‘Messages’ and bringing the ability to send unlimited free of charge iMessages to users of Macs, iPhones, iPads and iPod touches. Popular iOS-based applications such as Reminders, Notes, Notification Center have also been integrated into Mountain Lion, as well as sharing sheets being littered throughout the system for complete social interaction with services such as Vimeo, Flickr, Facebook and Twitter. Mountain Lion represents a monumental change for Mac users and goes way beyond being an evolutionary operating system upgrade, feeling more like a new relationship is being formed with OS X and iOS. 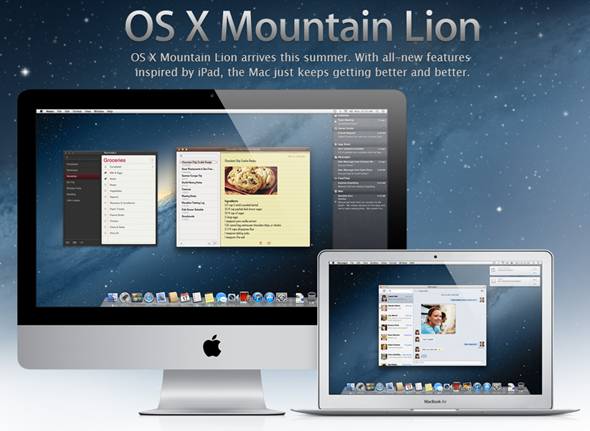 For more on what’s new in OS X Mountain Lion, check out ML features post here. As mentioned earlier, the released DP4 build of Mountain Lion is only available to registered Mac OS X developers, so if that applies to you then head on over to the Developer Center and download your copy now.